Rope training is nothing new. You may have been made to climb rope in the school gymnasium or may have seen or taken part in tug of war style games at school sports days/school open days. It is a mode of training that is now becoming popular with military style workouts and outdoor boot camps and creeping into gyms around the world. At my small Personal Training Studio I run regular small group sessions – for the cardio element I use the Battle Ropes – no boring old run around the block, boxing or cardio equipment. I train many clients who are unable to run or do a lot of high impact cardio work – e.g. overweight, back and knee issues, post natal. Using the Battle Ropes is fun and different – my clients can get that high anaerobic/aerobic workout with no impact on joints – perfect for new mums – no stress on their pelvic floor! I also train senior touch players – who despite being super fit still find the Battle Ropes an awesome challenge. 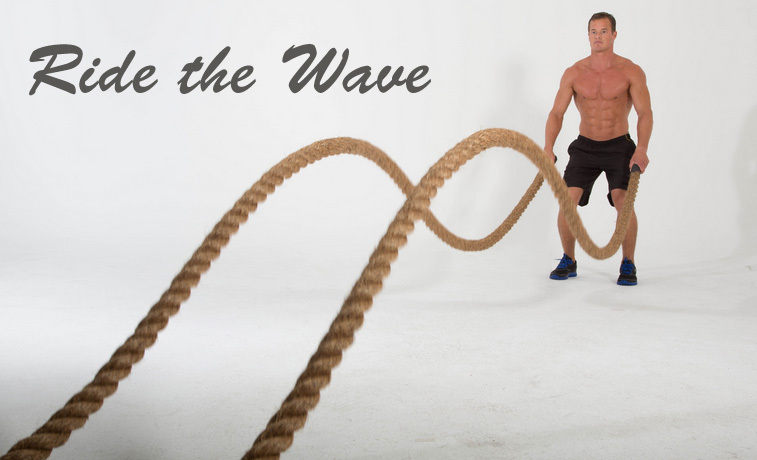 How to Ride the Wave – The goal of training with power ropes is to send waves down the ropes. You can vary hand positions as well as your range of motion and speed / wave size. Stronger users will generate waves that run further and faster and others may only send waves partway down the rope. 15m is the preferred length (doubled up)as it caters to all users. It allows for the full power of the wave effect for stronger users, and others select the portion of rope they are ready for (i.e. closer to the base of support). This also allows for progression in workouts and programs. Anchor your rope around a fixed object so the rope folds in half and you have both ends in your hands – use a post, a heavy kettlebell etc. Clients can hold 1 or both ends of the ropes depending on their fitness ability and length/weight of the rope. If you apply High Intensity Interval Training / Tabata Training to your Battle Rope workout you are on to a winner – just make sure you warm up and cool down correctly! What is Tabata Training? – When fitness enthusiasts and trainers talk about “Tabata training” or the “Tabata Protocol”, they are referring to a type of high intensity interval training. This training protocol involves performing a particular exercise (or exercises) at high intensity for 20 seconds followed by 10 seconds of rest. This is repeated 8 times for a total training time of 4 minutes. Power ropes work well with tabata interval training. It also allows beginners to maintain good form as intervals are only 20sec during the work phases. Single Exercise Tabatas Vs Multiple Exercise Tabatas – Perform the same exercise for each of the eight 20-second intervals or perform a series of different exercises to create a 4-minute circuit. You can also repeat the 4-minute Tabata cycle for multiple sessions. Generally, 4 sets of “Tabatas” are recommended with 1 minute of rest time in between each set for a total of 20-minutes. PLEASE NOTE: For my de-conditioned clients I only do this style of training for between 5-10 mins as part of a general conditioning workout – interspersing the Battle Rope exercises with lighter cardio – e.g. walking or gentle cardio on the BOSU. Also remember your de-conditioned clients need longer recovery time so please pay attention to how your client is coping with the intensity of the workout – nobody wants to puke – not on my watch! Main contraindication of using battle Ropes – Back issues. Ensure you teach good form – correct postural alignment – including scapula and neck positioning, core and pelvic floor engagement. Encourage your clients to let the whole body flow with the movement. If form deteriorates then stop and reset the body. Not All Rope is Created Equal – What Kind of Rope is Best? Due to the increased popularity of Battle Rope training more and more suppliers are selling Battle Ropes – however buyer beware! 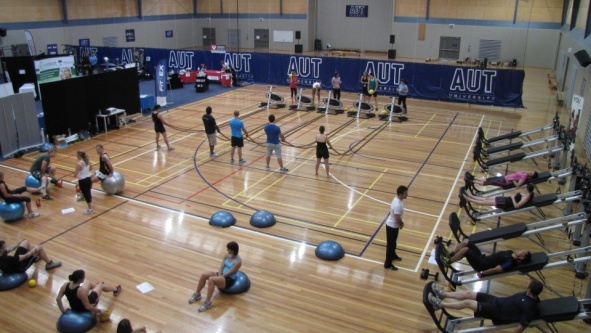 I have visited many gyms/studios and fitness trade fairs – tested out lots of different ropes available on the market. Most I can honestly say are either not long enough or are made of inferior material and not tightly wound therefore not effective as a workout tool – they are too light, they don’t wave well, don’t stand up to heavy usage, are prone to fraying, no good for using outdoors and can also give your clients nasty splinters. Most ropes you come across are made from Sisal or man-made fibres which tend to be a lot lighter (man- made synthetic fibre (Polypropylene) ropes are used in the marine industry as they float). Smoother finish double braided ropes as used in Yachting like yacht braid would be excellent but the price is astronomical. Pure manila rope is by far the best all-around rope for use in fitness drills. It is easy to handle, has good strength-to-size ratio, and does not have an objectionable stretch factor. Among the natural fibers, manila is the strongest fibre that comes from the leaf stems of the stalk of the abaca family. Manila rope is high in elasticity and strength, and is resistant to wear. Sisal rope, on the other hand, is from a cactus plant that grows in very dry areas and whose fibres are shorter and more splintery. Big difference! “Sisal rope has much the same appearance as manila but it is quite inferior in strength. “Even though it costs less. it is not cost effective because it breaks down quickly during use and when it gets wet. It might offer limited use in cases where expendable, but overall the cost is high when compared to manila rope. It is usually used when the strength of manila is not required (approximate 80% strength of manila) in smaller ropes. To differentiate between manila and sisal, you can distinguish them by means of colour. Manila fibres will be of light yellow to cream colour, with occasional reddish brown tones, whereas sisal will be of lustrous white. What Rope to use – Depending on your client’s abilities, you will need a rope that is between 32-36mm in diameter and 10-15 metres in length. The thicker and longer the rope the heavier it is. When considering the thickness of the rope – the thicker it is the harder it is for people to grip. Manila Power Ropes are easy to learn. There’s no impact and even newbies can pick up the motion quickly and get a fantastic workout in minutes. If you’re worried about learning something complicated and technical you won’t have a problem with ropes. As well as Cardio, the ropes will punish your core and give your grip a workout you’re unlikely to forget. It’s a fantastic tool to break up your training routine and give your system something new and challenging! Want to learn more about Battle Ropes? Cant wait that long? Contact admins@hqh.com re upcoming Modern Trends in Fitness Masterclasses or book an in-house masterclass for your Club/Gym. I hqve biokmarked itt for later! It’s like magic, creating your screen undoubtedly appears clearer and far better. To do this, you must determine which strategy you will take. This method includes jailbreaking your telephone first.